Apparently GoPro and I have different definitions of waterproof. About 19 months ago, I received a brand new in package GoPro HERO5 Black as a gift. I was so excited! I had the original GoPro Hero and said I would get an upgrade once GoPro introduced RAW into their cameras. The HERO5 Black is the first that did it, and my super wonderful partner heard me talking excitedly about it and surprised me with one for my birthday. There is a lot I like about the new GoPro (note: there is an even newer model out now, the GoPro HERO6 Black). On the HERO5, the image quality is MUCH improved over the first generation GoPro, menus are easier to navigate, the device is more intuitive, the profile is sleeker and smaller, and the voice control feature (which is something I didn’t even know I wanted) is a game changer and makes hands free operation so much easier. It also works well in colder temperatures and is easy to operate with gloves on, unlike my phone, which is the only other camera I have that fits in my pocket. Where this device fails is its ability to handle water sports. My GoPro HERO5 Black has been submerged in water exactly twice; once at a freshwater lake last summer and once this weekend while paddleboarding. In both instances the device was submerged to a depth of no more than three feet (waist deep with a person’s head above water) in fresh water for just minutes at a time. When SUPing this weekend I noticed a large blob of water in the front LCD and immediately brought the camera to shore to dry out. Now the camera won’t turn on at all, moisture is visible inside all of the ports (which were securely shut at all times when the device was in or near the water), and the final video I have on the memory card is corrupt. My GoPro’s dying video. As you can see, the device is clearly above water, and I’m standing in waist deep, shallow water when the device fails. The manufacturer claims this device is waterproof to 10m (33ft) without a housing as long as the ports are securely shut. This was definitely not the case with my model, and because the one year warranty period has passed I’m pretty much out of luck when it comes to replacing or repairing my device. GoPro doesn’t do repairs, which is a tragedy for the environment especially considering that my experience is not unique and many others are probably chucking their flooded GoPros into the trash and into landfills. Customer service wasn’t very helpful, although they did offer me a standard, 20% off one time discount on any camera (that must be purchased directly through GoPro’s website and cannot be combined with any other offer). While that might seem like a nice gesture, consider that we already paid for one at full price ($400 when the device was first released, which is what we paid, they now retail for $300), I’m not interested in paying another couple hundred for a replacement with the same faulty design ($400 for the original + $240 for a replacement = $640 spent on something that doesn’t even work as advertised). Thanks, but no thanks, GoPro. Unfortunately, I think this company has gotten too big to care about their customers anymore. The GoPro HERO5 Black honestly isn’t a bad little camera, but GoPro shouldn’t claim it to be waterproof. I’d actually probably still recommend it if to someone if they had plans to never use it in or near water. Unfortunately, this device is not as advertised and customer service was unhelpful and unwilling to admit that their device failed nor did they make a sincere effort to rectify the situation and retain a customer. At this point, I’m pretty disappointed and have very little confidence in this company or their products. My wet little GoPro, shown in the images below, is currently sitting in a bag of rice. I am hoping for a miracle, but have little confidence in one. If it gets resurrected from the dead, I’ll let you know. Please feel free to share this far and wide. I would hate for someone else to buy this device thinking it will be a great camera for snorkeling or other water sports and then ending up as disappointed and upset as I am. To see my original “First Impressions” GoPro HERO5 Black review, click here. Or you can search for all GoPro articles on my blog. Update 7/24/18: After fussing a bit, I was offered a greater discount – 40% off a new camera, bringing the price down to $180. 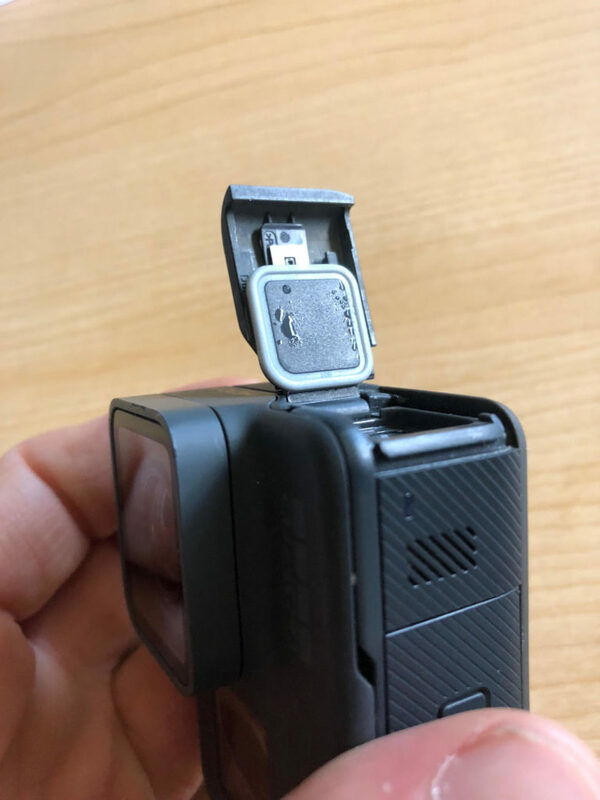 While certainly a more reasonable discount to replace an item that failed to live up to manufacturer’s claims, I still was not expecting to have to replace my GoPro after less than 2 years and don’t think I will buy another one at that price. Online, many other users have complained of similar issues with HERO5’s flooding, and a $180 is a lot to spend on a camera just because it’s small. I love the idea of having something I can use for swimming, snorkeling, and water sports without getting an expensive, dedicated underwater housing for my DSLR, but it’s clear that the HERO5 doesn’t fill that niche. Frankly GoPro should just market the HERO5 as splash resistant instead of waterproof and/or they should include the optional $50 waterproof dive housing with the camera; their failure to do so makes me distrust them as a company, and I’m not sure I want to buy and be disappointed by yet another one of their products. I’ve asked GoPro to combine the 40% discount with the $50 off trade-in option, as I have an older generation GoPro that I never use and would happily trade in for a new device, and $130 is about what I feel comfortable paying when we already spent $400 on on Hero5 just a year-and-a-half ago. Unfortunately, GoPro won’t let me combine those discounts, so it looks like I’ll be GoPro-less for at least the near foreseeable future. Additionally, after leaving my HERO5 in a bag of rice for more than a week, the device still won’t turn on or show any signs of life, and there is still a small(er) water bubble visible in the front LCD. Looks like that one is DEAD dead. RIP birthday GoPro. Thanks for all the memories and a handful fun photos along the way. Posted in Photography, Reviews and tagged GoPro, GoPro 5, GoPro Hero 5 Black, waterproof cameras on July 11, 2018 July 24, 2018 by Kari. 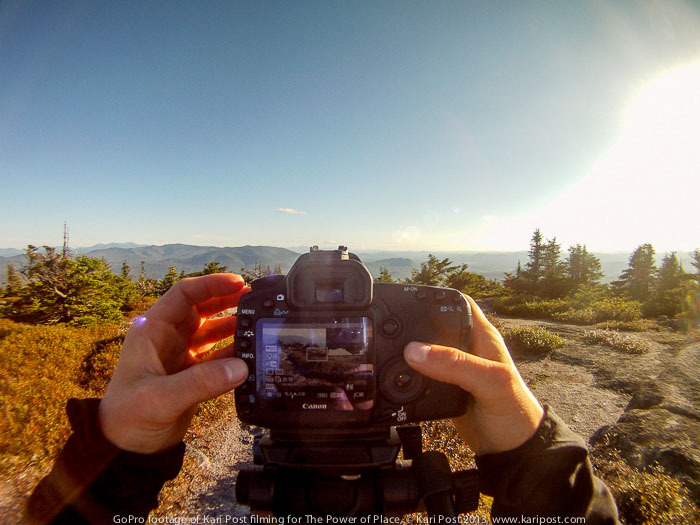 While true to an extent, having a capable camera that allows the photographer more control does make a difference in creating a compelling photo. Sure a good photographer can take a good photo with a 35mm disposable camera, but the chances of getting a good photo of the aurora borealis or capturing the fraction of a second it takes for a frog to extend its tongue to capture an insect with one is highly unlikely, if not impossible. On the same note, you can throw the latest camera and sharpest, fastest lens available into the hands of an unskilled snap shooter and the likelihood of them producing a compelling image is not much better. It’s not just the camera, but it’s not just the photographer either. The truth is, it’s a little bit of both. I have four different “cameras” I use regularly. Each camera fills a unique niche. There are photographs I’ve taken with my DSLRs that I could never replicate with my smartphone, but there are some pretty unique photos I have with my smaller cameras that I would have missed entirely if I had tried to shoot them with a full frame professional bodied Canon. Photographers should learn how to use every camera tool available to them, as well as recognize the limitations of different systems. My two current DSLR cameras are a Canon 5D Mark II and a Canon 1D Mark IV. 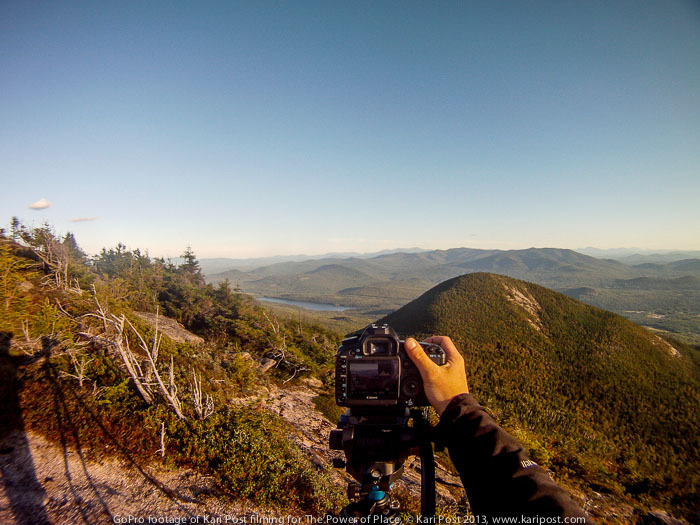 The 5D2 is a bit more compact than the 1D4 and has slightly higher resolution, making it a better option for carrying while hiking to get landscape photos. However, the 1D Mark 4 has a much better autofocus system (shooting moving subjects with the 5D2 is frustrating to say the least) as well as a cropped sensor, so it is my preferred camera for shooting sports and wildlife. In general, when I am shooting photos with the intent to sell them, print them, and get the highest quality image, I prefer shooting with DSLRs. However there are times when my other cameras are better options. Photo with my 5D Mark II. For waterfalls, you can’t beat a DSLR. Shooting with a DSLR allowed me to shoot with a slow shutter speed, use a polarizing filter, and mount to a sturdy tripod, all of which are less easy to do with smaller cameras. 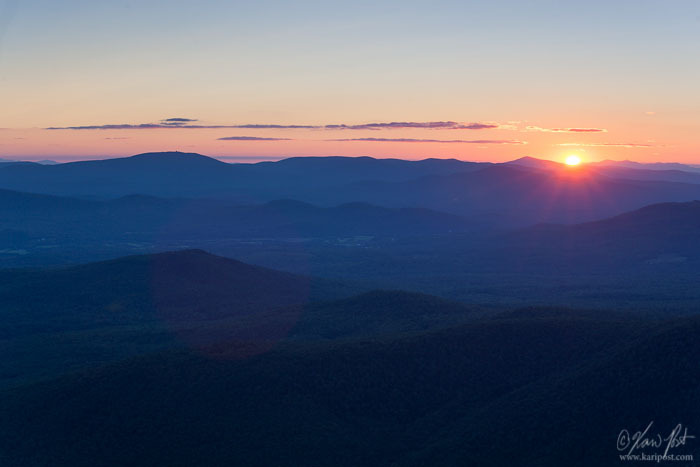 This photo would make a gorgeous statement art piece hung on a wall, and thanks to shooting with a high resolution camera, it will hold up to being printed big. One of the biggest advantages of shooting with my iPhone 6 is that I usually have it on me. Sure it’s a phone and an older model; the newest iPhone and smartphone models have higher resolution front and rear cameras, as well as the option to shoot RAW (DNG) using the Adobe Lightroom app. Yet even shooting 8MP jpegs, I have gotten some great images; I have had folks request to buy quick shots taken with my phone and posted to Instagram more than once. My first DSLR (a Nikon D70) was only 6 megapixels, and when I started shooting with it I only shot JPEG because I was too poor to afford higher capacity memory cards and RAW processing software – the photos on my website from 2005 and sports photos from 2006 were all shot this way. My iPhone is great because it fits in my pocket, captures high dynamic range sunrises and sunsets quite beautifully thanks to its built in HDR, records video with the swipe of a finger, and allows me to share and post images instantly. When I am shooting everyday life, convenience goes a long way, and even if the iPhone lacks a lot in terms of professional features, its portability and ease of use makes it the camera I probably use more than any other. Photo with my iPhone. I didn’t bring my DSLR to Montreal with me to celebrate my birthday with a friend a few years ago, and even if I had I would have needed a tripod to capture a still image of this beautiful old building in the fading light. My iPhone enabled me to capture a shot of this beautiful sunset, even when it wasn’t a part of the plan. The other camera I have that I really like is my GoPro Hero 5 Black. Like the iPhone, the GoPro is small and portable, but it has the advantage of being waterproof and weatherproof. Whenever I am doing water sports or headed out in the cold, I bring my GoPro with me. It’s super easy to operate with gloves on and doesn’t suffer from non-existent battery life in cold weather (my phone pretty much dies whenever temps drop below freezing, which is pretty much all of winter here in New Hampshire). It is small enough to wear while doing activities, such as mountain biking or snowboarding, where carrying a larger camera is not only impractical, but also dangerous. The wide angle of view makes it the perfect point-of-view camera, as it was intended, and its small stature makes it one of the best “selfie” cameras, especially if you are a fan of capturing more of your surroundings. Like my iPhone, the GoPro is pretty easy to use when it comes to taking snap-shots – no focusing is required – so it’s a much easier camera to hand to friends so they can take your picture if needed. The Hero 5 is the first GoPro to capture RAW stills, which makes editing and polishing your photos even easier. Photo with my GoPro. The GoPro is an ideal wearable camera for when you want to capture an image but need your hands free. The GoPro Hero 5 also allows you to control the camera with your voice, an added benefit when you need your hands for something other than pressing the shutter. Bonus: It’s waterproof, and while I trust myself to keep my DSLR dry while kayaking on flat water, all bets are off when you add a dog to the mix. Kayaking with Winston is like having a bowling ball in the boat. My GoPro enables me to capture images like this without taking huge risks. I’ve resisted posting photos taken with the latter two, smaller, “inferior” cameras to my website, but those images regularly end up on my Instagram feed and personal social media pages. Maybe I’ll get bolder about sharing them more widely. When presented in the right way and printed appropriately sized, photographs taken with these cameras are just as beautiful as those taken with my professional cameras, and sometimes, because of the unique opportunities shooting with these cameras present, I cherish the images even more. Posted in Photography and tagged cameras, Canon, Canon 1D Mark IV, Canon 5D Mark II, DSLR, equipment, gear, GoPro, GoPro Hero 5 Black, iPhone, iPhone 6 on December 28, 2017 March 2, 2018 by Kari. 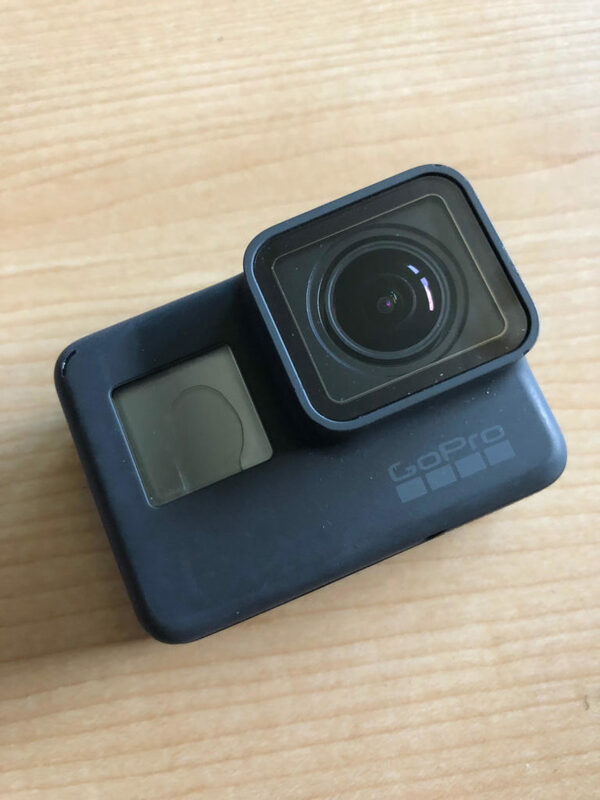 Update: Please read my updated review GoPro HERO5 Black Review Update: Doesn’t Play Nice With Water published July 11, 2018. I really love point of view (POV) cameras. As an adventurer, there are many times when a lugging around and shooting with big DSLR camera isn’t practical but I still want to be able to share my experience with others. Small, wearable action cameras make shooting on the go much easier and allow you to focus on your adventure and capture images at the same time. GoPro has been a leader in consumer priced wearable action POV cameras since they became a thing. I was so psyched with the concept that I bought an early generation GoPro back when they first hit the market, but I ended up rarely using it. The first GoPro cameras were not user friendly – switching settings on the camera was not intuitive at all – and the image quality left much to be desired. 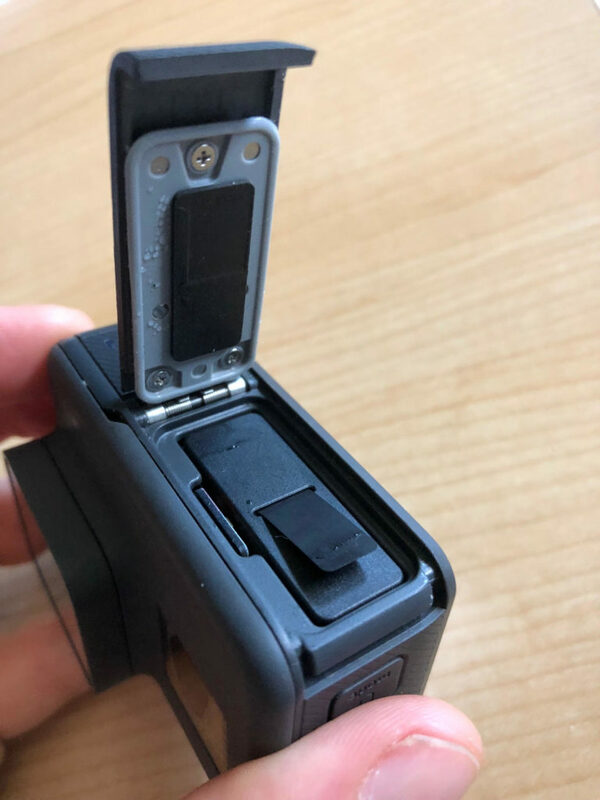 With each new model GoPro made changes to the camera menus, settings, and operating systems as well as improvements in performance, and they started to become more popular with professional and amateur athletes, photographers, and filmmakers but I still refused to upgrade. For a GoPro to be useful to me as a professional shooter, I really wanted the ability to shoot RAW photos not just JPEGs. Enter the GoPro Hero 5 Black with RAW still photo capability. Recently introduced, this camera finally had everything I wanted in a wearable POV model – ease of use, small size and low profile, a variety of mounting options, waterproof, and RAW shooting capabilities. I’ve now owned one for about 24 hours and can say this camera is truly night and day from my first GoPro. I can easily see this becoming an essential part of my regular kit as a photographer and everyday excursions as an outdoors enthusiast. Image Quality – So much better. The GoPro Hero 5 Black handles high contrast and backlit scenarios much better than my first GoPro, as one would expect. Details are sharp, colors are accurate, and both shadows and highlights are nicely rendered. The camera does a good job of balancing details in light and dark areas while still producing an image with natural appearing contrast and saturation. RAW Files – The Hero 5 Black produces JPEG files with sidecar .GPR files. Originally I thought the Raw files would be .DNG (Adobe Digital Negative) but it turns out the .GPR files are an extension of the .DNG format. You’ll need the latest version of Adobe Camera Raw or Lightroom to open and process these files – I had to upgrade from Lightroom 4 to Creative Cloud – or you can download GoPro Studio for free. Viewed in Lightroom, the .GPR files are ok. Compared to the native jpegs from the camera, the .GPR files are more saturated and have funky color vignetting caused the exagerated wide angle perspective of the lens – the edges of the frame are not only darker, but bluer in color. This was very evident in the photos I took of white snow – the jpegs did a better job of representing the snow as an even white color across the entire frame. Colors of the jpeg also appeared more neutral and natural – flesh tones and the magenta fleece I was wearing appeared a little greener compared to the RAW file. After tweaking sharpness and noise/masking levels in Lightroom, it was possible to get more fine detail in the RAW file. One nice thing is that the GoPro creates both a full size jpeg file and .GPR file when writing images to the memory card, so you have access to both. The jpegs straight from the camera are honestly quite good, but it’s nice to have access to a file with greater editing latitude. It is also important to note that RAW files are NOT created when the camera is in burst mode – something I didn’t realize until after my test run yesterday – and there are a few other scenarios where GoPro RAW doesn’t work, explained on GoPro’s website. Overall, I think the RAW files are slightly disappointing when viewed with the default settings in Lightroom, but things like color rendering and light falloff should be easy to fix in future software updates and better profile settings from Adobe. For the company’s first foray into RAW the quality is acceptable, and the fact that you get high quality jpeg images alongside the RAW files is a big plus. You can definitely take good images with this camera! Menu Navigation and Settings – The Hero 5 is easy to use, something you could not say about GoPro’s first POV cameras. When you first start up the camera, there is a tour that explains how to do most things, and nearly everything on the camera is controled by two buttons and an LCD touch screen. Changing from photo to video mode is easy and adjusting important features like resolution and frame rate is simple and intuitive. The menus are well organized and make sense and give access to the most important things without being cluttered and confusing. The LCD provides a very clear image and appears to be high quality. The touch screen is responsive. Voice Control – This feature is AWESOME. I haven’t exactly nailed the commands yet – I tended to make them overly complicated and said things like “GoPro Capture Still Photo” which is not a recognized command whereas “GoPro Take a Photo” is. Even so, it worked most of the time, and it’s possible that nearly all the times it didn’t were because of user error. The ability to take completely hands free photos is a game changer, especially when paired with a number of GoPro’s wearable mounts. I can think of so many scenarios where this is helpful – when paddling a kayak or helping your kid pizza down a ski slope. If you set beeps to on, you can tell if the GoPro heard you even if you aren’t looking at it thanks to audible cues. 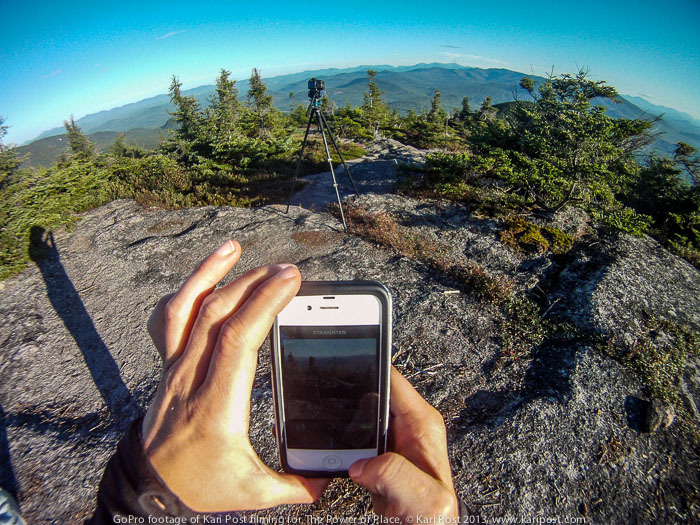 Smartphone Apps – I downloaded all of the apps GoPro makes to my iPhone, but so far have only tested the Capture app. Setting it up with my camera was pretty easy. I synced the two via Wifi. The camera is also supposed to sync via BlueTooth but every time I connected to the camera I had to use the Wifi connection, which mean I could not connect to both my camera and internet at the same time – I’ll have to play around with it more to see if that can be fixed. When I was connected, it was easy to see the camera’s view on my phone, and I could also go through and look at all of the media I took and download photos or videos directly to my phone. This made sharing snapshots on social media a breeze – once I switched my Wifi connection back to the internet. I didn’t try using the app to shoot and control the camera out in the field because my iPhone’s battery life drains quickly in cold temperatures, so I only used the app briefly when I returned home to share a snap to Instagram. Battery Life and Performance – My camera shipped with a battery about 15% full, which died pretty quickly upon me fiddling around with it, but I was very excited and probably fiddling a lot! It comes with a USB charging cord and you have to charge the battery in camera (unless you get a supplementary charging port from GoPro). The media I read said it would take 2 hours to charge plugged into a wall and 4 hours plugged into a computer – I plugged mine into a wall and had a full charge within 1 1/2 hours. After about an hour of use, worn on a chest mount in temperatures right around freezing with the GPS on the entire time, I had about 55% of my battery life left. I wasn’t recording the entire time but did take a fair number of stills, bursts, and some video. Because so many factors affect battery life, including environmental factors, recording mode, and other things it’s impossible to say how long the battery will last in “normal” conditions. To better understand the many factors that affect battery performance and anticipated battery length in different recording scenarios, check out GoPro’s website. I’ve only taken the camera out on one trip, a hike through the snow covered woods with my dog, and tried a limited number of settings during that time, but so far I really am enjoying the new GoPro. I look forward to using it more and can definitely see it becoming my “have everywhere” camera. It makes a great portable pockable point-and-shoot to complement my iPhone, and the fact that it shoots RAW will give me added opportunities to shoot professional quality work with a tiny, easy to use camera that I can have on me at all times. Update 7/11/2018: Unfortunately, my beloved GoPro died a sad death on its second in water adventure. I cannot recommend this camera for extreme water sports or in water use. Please read my updated review here. Posted in Photography, Reviews and tagged .GPR, action camera, first impressions, GoPro, GoPro Hero 5 Black, GoPro RAW, Hero 5, POV camera, review, wearable camera on December 14, 2016 July 11, 2018 by Kari. Finally a GoPro that shoots RAW! 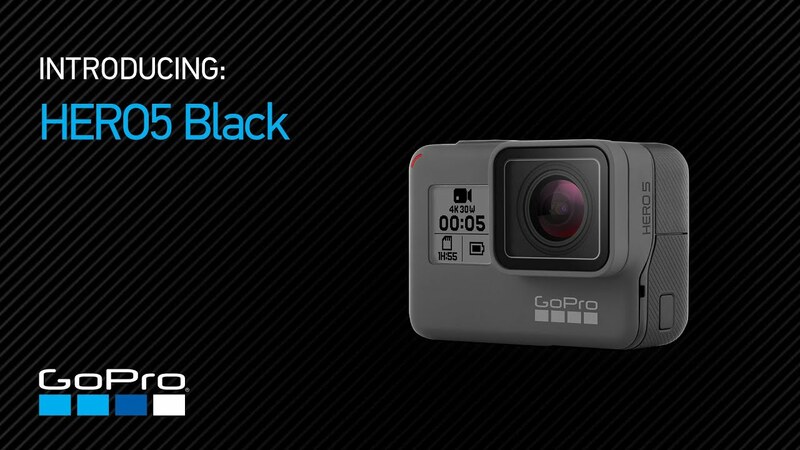 The GoPro 5 was just announced today (along with a GoPro drone that looks pretty sweet) and I’m so psyched about it! I own a first generation GoPro which I use very infrequently – it leaves much to be desired. Even though newer models are more user friendly and have better image quality, I held off buying an upgrade because I wanted the capability to shoot RAW stills. Now, finally five generations later, we have it! RAW is an awesome tool. 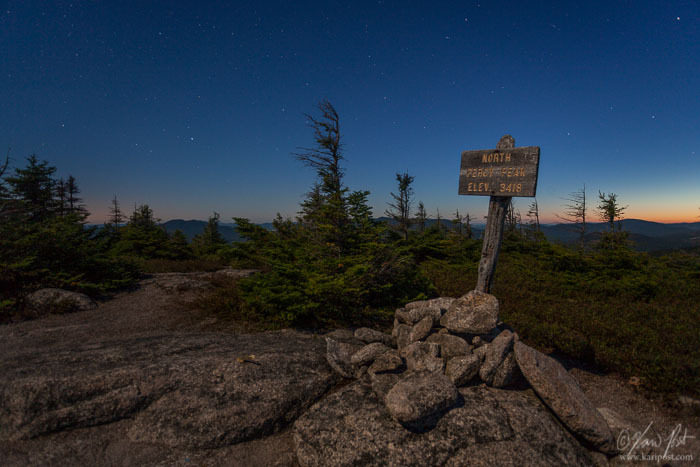 RAW files give you increased flexibility when it comes to processing images, and details such as highlights and shadows are much more easily recovered from RAW files than jpegs. 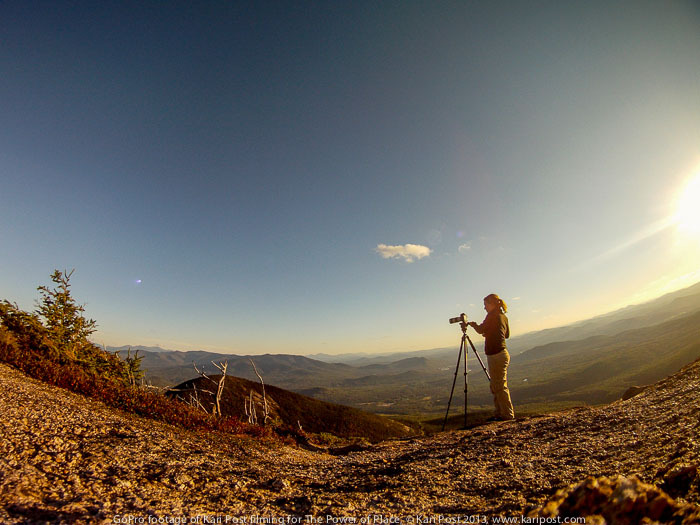 You also have more latitude when it comes to exposure, sharpness, and color. With the GoPro, this is incredibly important because the wide shooting angle and field of view almost always guarantee a lot of sky and non-sky in your shot, which generally means a scene with a lot of dynamic range – bright highlights and dark shadows are super common. Wider angle shots are typically more challenging to expose for as well. GoPros are awesome because they have advantages big DSLRs don’t – they are small, portable, wearable, and can go underwater. Adding RAW suddenly makes the GoPro 5 a usable professional camera, all for just $399. I’m psyched! Today GoPro also introduced a super cool Karma drone that comes with a game changing stabilizing grip, as well as an upgraded GoPro Session 5. File the drone and grip into “products I didn’t even know I needed” category of stuff. Of course now I want them. On the plus side you save $100 when you buy the Karma drone (grip included) and GoPro 5 together for $1099. Now, I just need to find an extra thousand dollars of spending money between dog, car, and house bills and updating my website. Ugh! Maybe everyone I know can chip in and get me one for my birthday and Christmas. Check out the new GoPro 5 family of products and Karma on GoPro’s website. Posted in Photography and tagged drone, GoPro, GoPro 5, GoPro Karma, Karma, POV camera, RAW, wish list on September 19, 2016 by Kari. 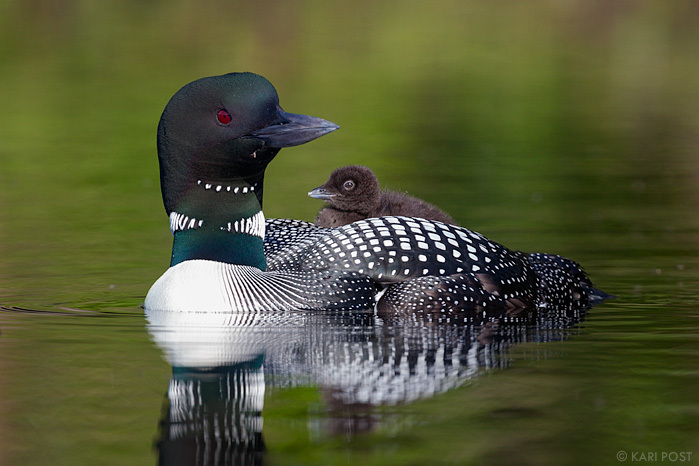 By now you’ve probably figured out that I LOVE loons. They are seriously cool birds and make very interesting subjects to photograph. Yesterday, I headed out to one of my favorite ponds to see if the nesting pair I had photographed a couple of years ago had returned. Sure enough, they were there and had a little baby in tow! 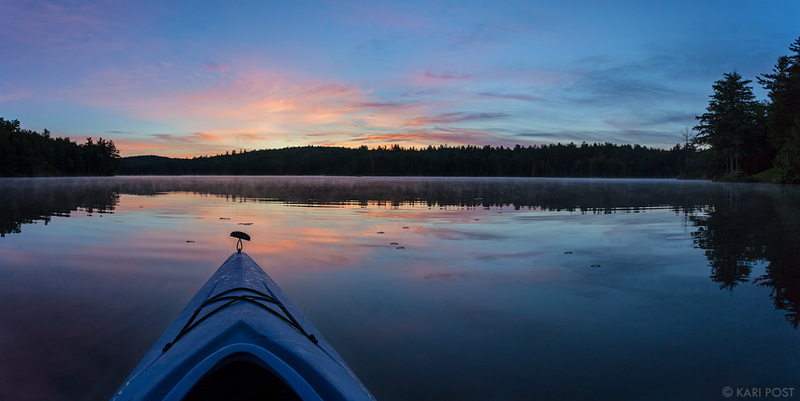 This pond is less than 20 minutes from my house now that I’ve moved, which means that sunrise shoots are super manageable, even during the summer, when days in New England are quite long. I woke up at 4am in time to photograph yesterday’s sunrise and then spend a couple of hours with the loons before the light got too harsh. Here are a few quickly processed shots from yesterday. I haven’t even put them live on the website yet, and still have to edit a bunch of images, but I’m pretty happy with my first real photo shoot of 2014. I also created this quick video with some GoPro footage (from my ancient first generation GoPro) to show you what it’s like to spend a morning on the pond. As you’ll see I use both my iPhone and 5D Mark II to capture images. I love having the ability to instantly share photographs from the field using the iPhone, but the DSLR beats it hands down when it comes to quality. 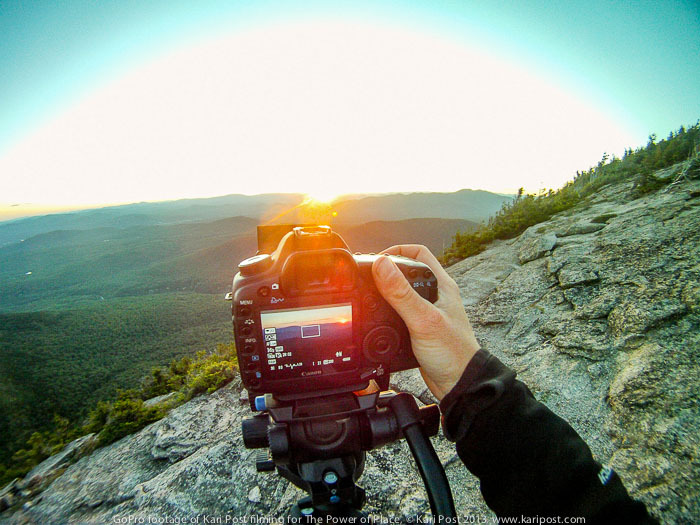 Posted in Photography and tagged common loon, GoPro, loon, New Hampshire, paddle, sunrise, video on June 18, 2014 June 18, 2014 by Kari.